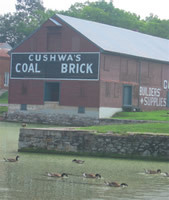 The classic canal town of Williamsport, home to Cushwa Basin, is one of my favorite places on the canal. 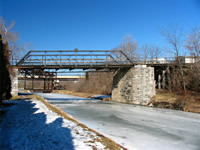 Along this half-mile stretch of towpath lies an abundance of canal features, including an aqueduct, turning basin, warehouse, lock, lockhouse, and two unique bridges. Opportunities for recreation, sightseeing, and learning about history abound. I tend to walk early in the morning to enjoy the serenity of the canal. 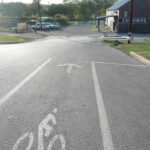 I like going out on the Conococheague Aqueduct and then heading downstream to Lockhouse 44. 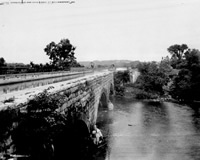 The aqueduct was breached in 1920 by Captain Myers. 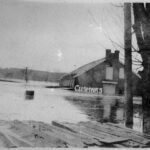 The missing timber wall was rebuilt only to be destroyed again by the flood of 1924. A bunch of bikers are there this morning dismounting their bikes to safely cross before continuing on their way. 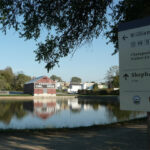 Heading downstream, the bright red Cushwa warehouse is reflected in the turning basin. 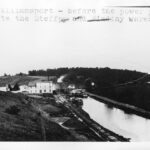 Williamsport was one of only a few places on the canal where cargo boats could completely turn around. Today it's hard to imagine how busy the basin and warehouse were during the heyday of the canal. Boats would have been lined up and down the canal waiting to load and unload cargo. This morning only a flock of geese seem to be stirring. 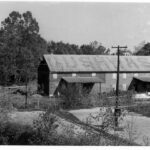 On the hill next to the warehouse is the Trolley Barn, the power-generating station for the trolley line that ran between Williamsport and Hagerstown. Today, it houses canal exhibits and in a few hours will be active as groups of students will be coming to learn about the canal. As I keep walking, I see two one-of-a-kind bridges - the railroad lift bridge and the Bollman bridge. 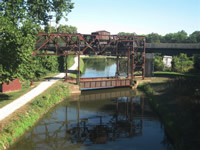 The Railroad Lift Bridge was built in 1923, but used for just a year until the canal closed in 1924. 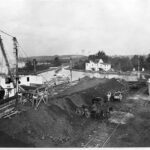 A stone's throw downstream is an iron truss bridge designed by the renowned, self-taught engineer Wendell Bollman. This rare gem was completed in 1879 and restored in 2004. This morning several fishermen are enjoying the bridges as a favorite spot for catching carp, bass, and catfish. Further down lies lock 44 and its adjacent lockhouse. The two create an idyllic setting. One can imagine a boat horn blowing and a family coming out of the lockhouse to help an oncoming boat lock through. Today the lockhouse is opened on weekends for guided tours and weekdays for educational programs. As I head back to the Cushwa Warehouse to start my workday, I reflect on how lucky we are to have such rich historic resources all right here in Williamsport. The historic fabric of so many other canals across the country has been lost to time, progress, or neglect. 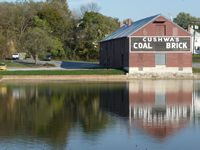 Yet here, the canal is still relevant - people bike and hike the towpath, fish in the canal, and seem to be a sponge to learn all the lessons history has to teach. I have a great job.